Services - Micro Filtrations, Inc.
Micro Filtrations provides timely, comprehensive testing services for cleanrooms and clean devices. Our expertise and equipment will ensure your facility or devices’ continued adherence to the current industry standards, and advise you of preventative measures to maintain compliance. In order to educate our clients on our findings and recommendations, our customers receive an extensive GMP/CFR 211 and ISO-compliant technical report. Our compounding pharmacies receive the report of findings in a format to address USP797 compliance. We pride ourselves on a proactive approach to troubleshooting technical issues, which means that we try to solve problems before they ever occur. Our technicians are among the most certified in the industry, trained to diagnose small issues that could escalate. Request a quote to determine how MFI can help keep your facility in compliance. To ensure these systems meet requirements. This testing includes Oil and Moisture, Airborne Viable, Dew Point Measurements and Non-Viable Testing. Learn more about what USP 797 is, why it matters and how Micro Filtrations can help your business comply with this critical set of regulations. Issued by the United States Pharmacopeia (USP), which sets standards for the “strength, quality, and purity of medicines,” the intent of USP797 is to safeguard the sterility of environments used for the creation of pharmaceuticals. In other words, USP 797 protects consumers by providing operational standards for compounding pharmacies. These standards help to ensure a facility is free from infection and other harmful elements. What sorts of tests need to be performed? USP 797 compliance involves both non-viable particle sampling and viable particle testing. 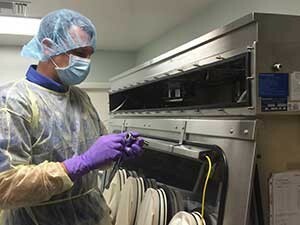 Through airborne and surface particle sampling, gloved fingertip sampling, and media fill testing, the contamination levels of your clean room can be tested and analyzed. Additional room elements to be benchmarked include biosafety cabinets and isolators, HEPA filters, laminar flow, room air exchange rate and pressurization, room pressure gauges, gowning, and air flow visualization. What facilities are held to USP 797 standards? All facilities that make compounded sterile preparations (CSPs) fall under the umbrella of USP 797. These include hospitals, pharmacies, patient clinics, doctors’ offices and any other compounding locations that prepare, store or distribute medication. USP Chapter 797 provides minimum practice and quality standards for compounded sterile preparations (CSPs) of drugs and nutrients, based on current scientific information and best sterile compounding practices. All healthcare facilities that prepare compounded sterile preparations fall under the umbrella of USP 797. However, not all states have adopted the USP 797 as the required standards. Please visit clinicaliq.com for more information on what states have adopted USP 797. What are the first steps to compliance? First, measure the risk level of your compounding activities using the ASHP Discussion Guide on USP 797. Then in consultation with MFI, develop and implement an action plan. How can Micro Filtrations help with USP 797 certification? Our CETA-certified technicians will guide you through the testing process, teach you how to interpret your test results, then consult with you on your facility’s next steps. In addition, we offer consulting on the design and implementation of cleanrooms so that your initial set-up will achieve and then maintain compliance. Our comprehensive knowledge of industry standards will ensure that your facility achieves continued compliance. Whether you are building a new facility or improving upon an existing one, the expert team at MFI can help you determine and then achieve your goals. Our role as leaders in the contaminant control industry since 1979 means that we’ve seen it all; our experience allows us to expertly design cleanrooms, sterile pharmacies and other clean environments. Request a conference call to discuss how MFI can help keep your facility in compliance. Four of our technicians hold the certification of Registered Cleanroom Certification Professional – Sterile Compounding Facilities (RCCP-SCF). This training will ensure that the technician has the experience to test your sterile compounding facilities per industry guidelines. 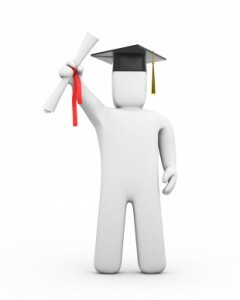 The Controlled Environment Testing Association’s National Board of Testing (CNBT) provides this certification. Our NEBB-certified CPT technicians have proven they have the experience to properly administer and test cleanrooms to NEBB procedural standards. 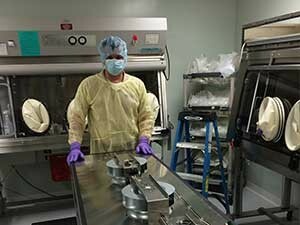 The team members certified with the Biosafety Cabinet Field Certifier Accreditation are qualified by the NSF to routinely test biosafety cabinets and ensure their adherence to NSF requirements. We have a Council-Certified Indoor Environmentalist on staff, who has demonstrated the knowledge and experience to consult on asbestos, lead, HVAC, building science, chemicals, mold and microbial contamination related issues. Also on our team is a Council-Certified Environmental Infection Control Investigator, who consults on environmental infection control issues in hospitals, schools, clinics, urgent care centers, assisted living facilities and other environments.